Since I cannot see into the nest, I have to reply on indirect evidence that an egg(s) have hatched. Mom Kate is showing one of the behaviors. In her talons she has a mat of litter that has been soiled by the chick. All birds keep their nests very clean and remove the soiled nesting materials. 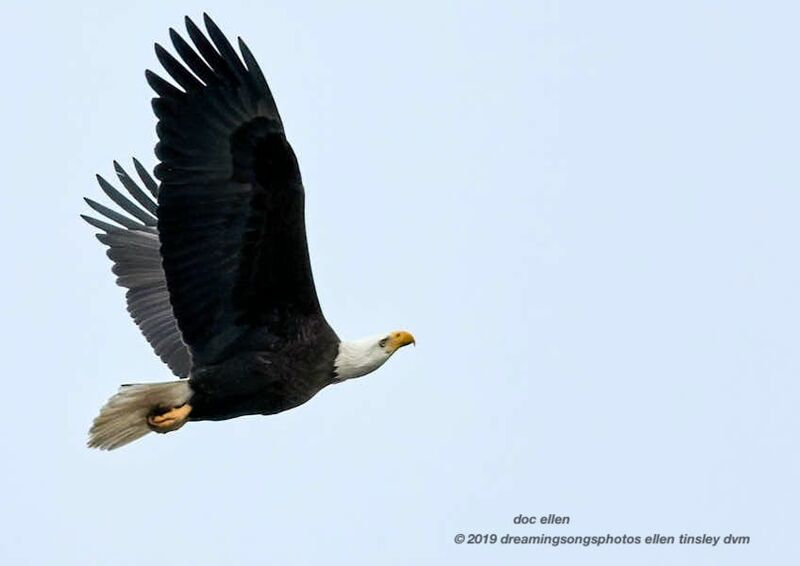 Eagles take the used litter far from the nest before letting it drop to the ground. Dad Petruchio is showing the other good indicator that there has been a hatch: feeding behavior. 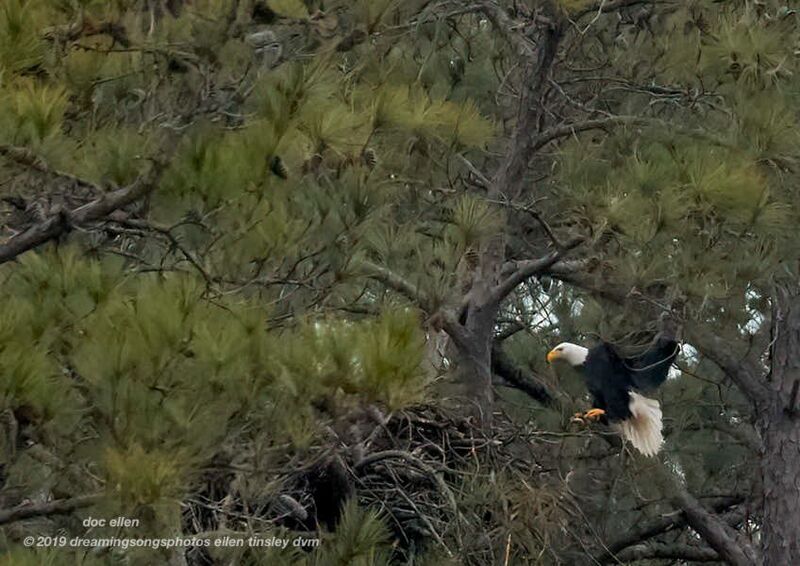 Here he is bringing a small fish to the nest. 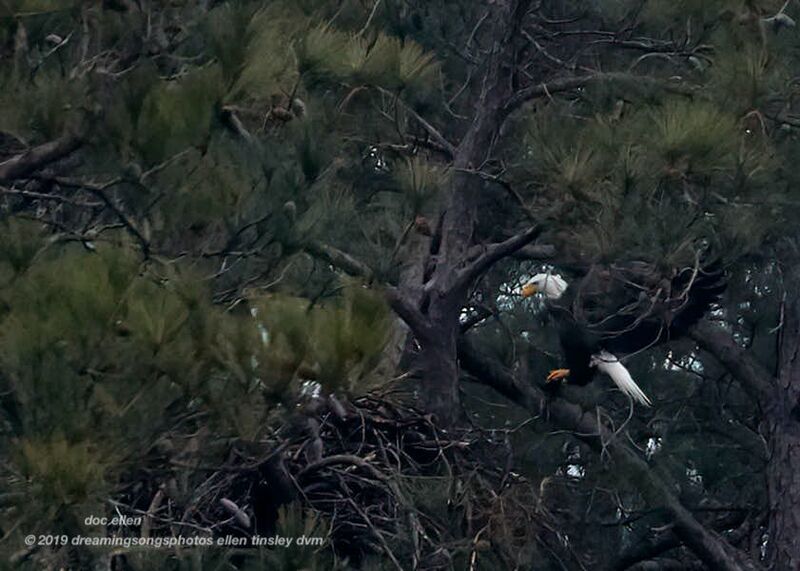 He then stands just within the nest, pulls the fish apart and leans over to feed the chick. It didn’t take Petruchio more than a minute to feed the small chick. Dad Petruchio often takes a moment, as in this photo, and just watches the chick. 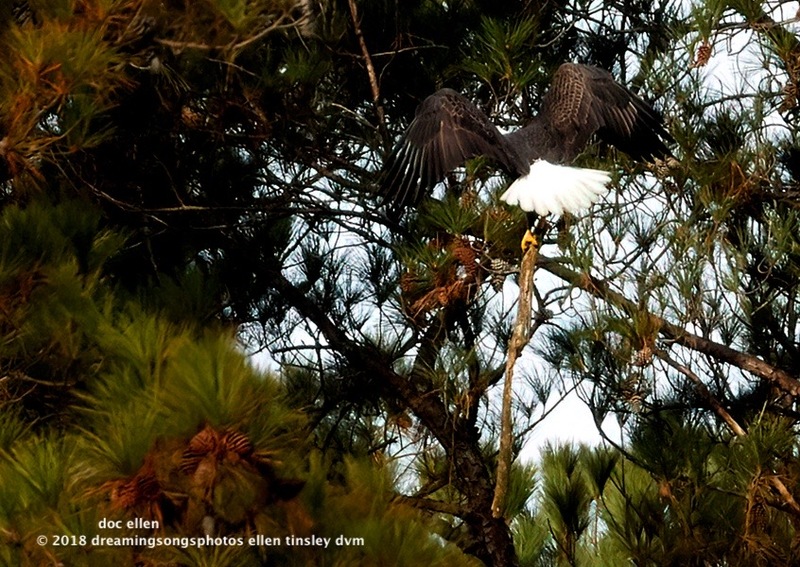 Parent Bald Eagle hand-off of nest duties. I heard Kate start to call from the nest and knew that she was seeing Petruchio. He was out of my sight, then I blinked and he was in the nest. 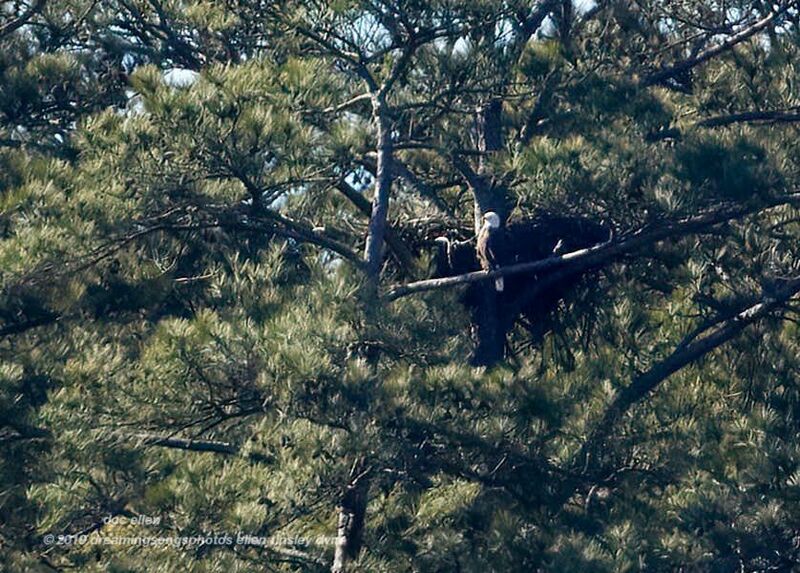 2 blinks later, Kate was out of the nest and way down the cove, heading for the main lake. I found both mom Kate and dad Petruchio in the nest this morning. That is dad Petruchio looking out. 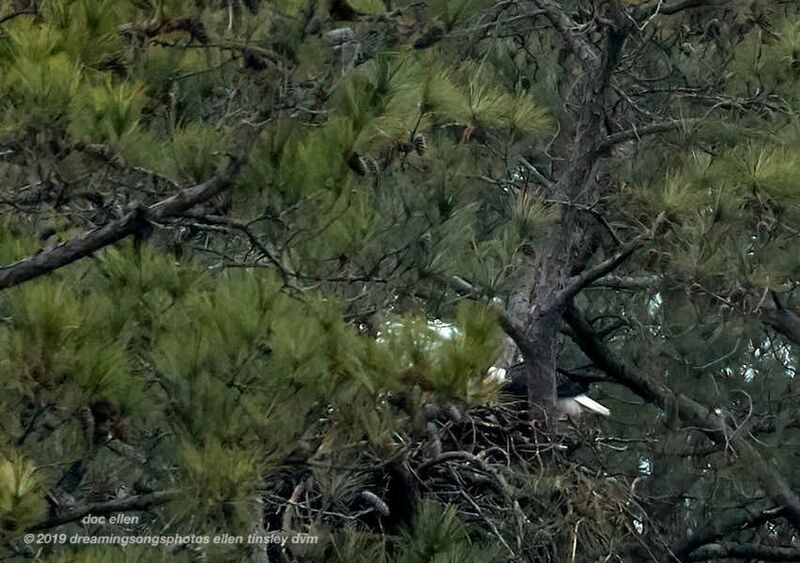 You can see Kate to the left and toward the middle of the nest. Petruchio went across the cove and around the bend, out of sight. He re-appeared with a bunch of soft grasses for the nest. Mom Kate had made a nest cup within the main nest before laying her egg(s). The cup holds the egg(s) securely and keeps them from rolling into possible danger. The egg cup is made of soft materials and the lining gets packed down. The parents need to replenish the lining at least daily. Petruchio delivering his bunch of nest materials. 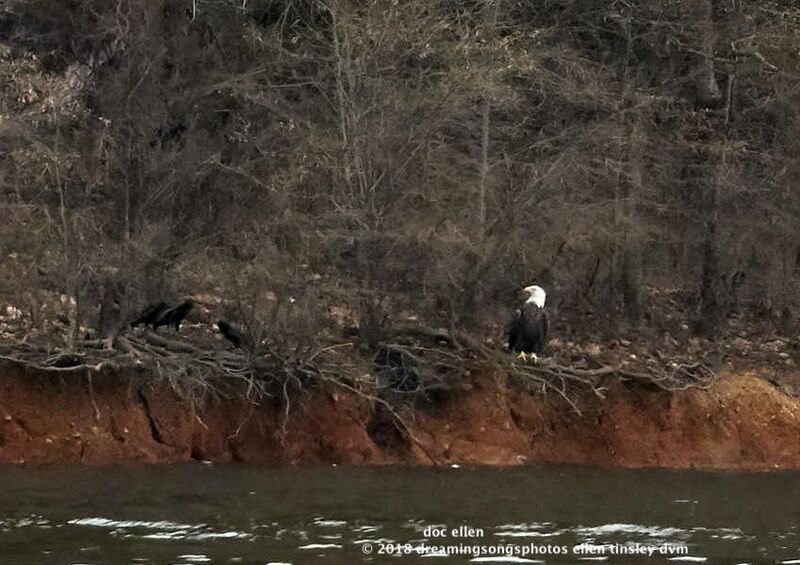 The bald eagle breeding season has started at Jordan Lake. 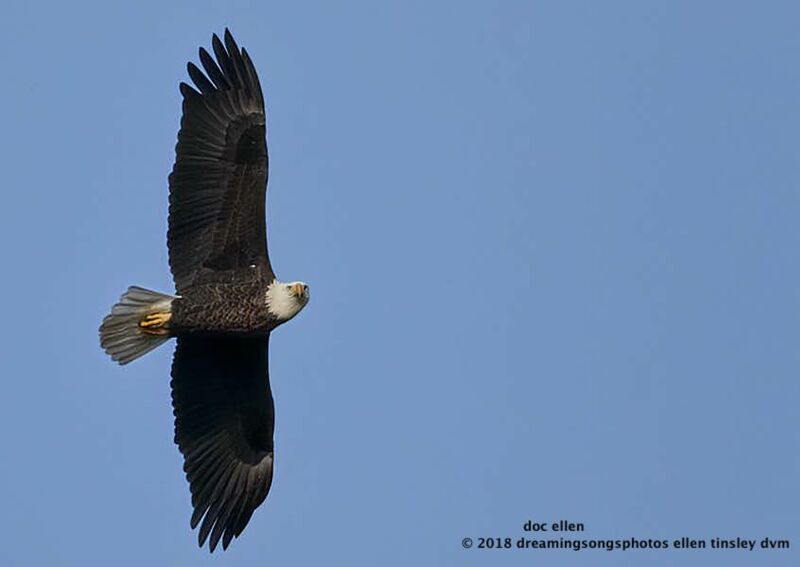 The parent eagles have begun repairing the nest and getting it ready for the hoped-for new family. Petruchio, the father of First Nest, weighs about 9-10 pounds. 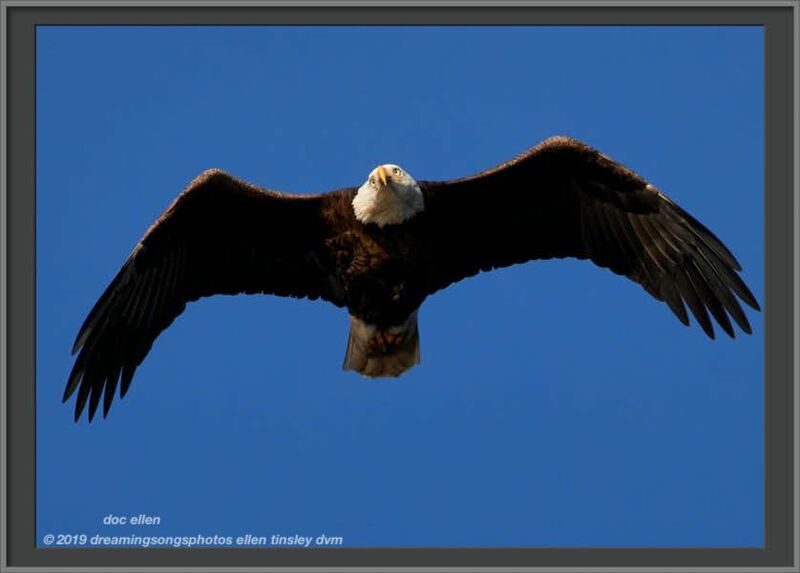 A male bald eagle stands about 30 inches tall. 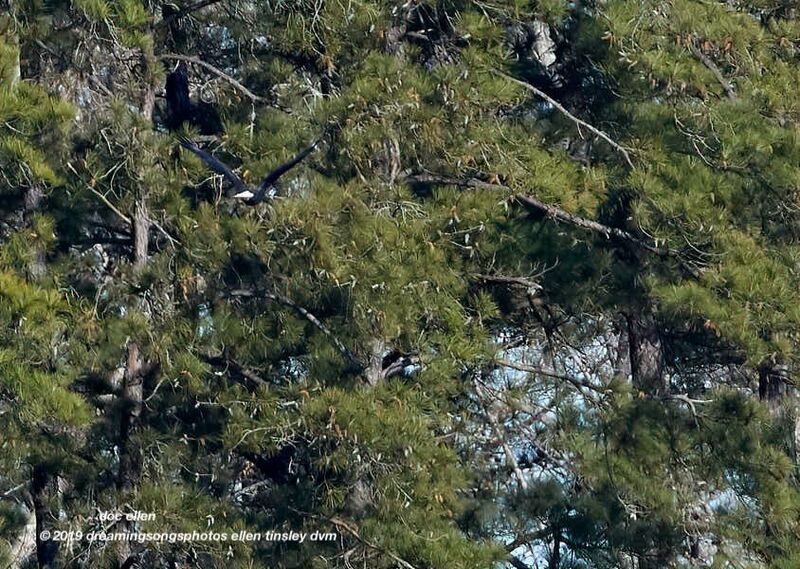 That repair branch that he is hauling up to the nest, brings to mind just how powerful a bald eagle is. Here you can see the grip of his talons around the branch. 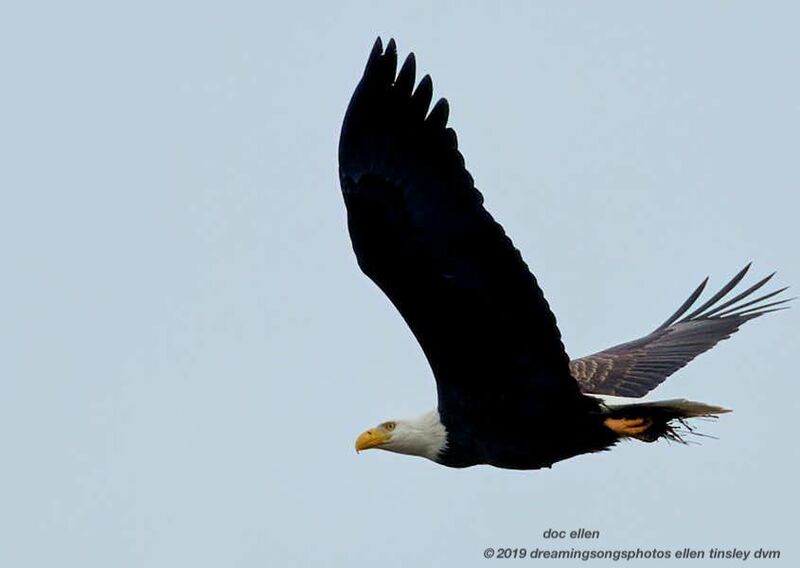 The branch is roughly 3 times longer than the eagle is tall. 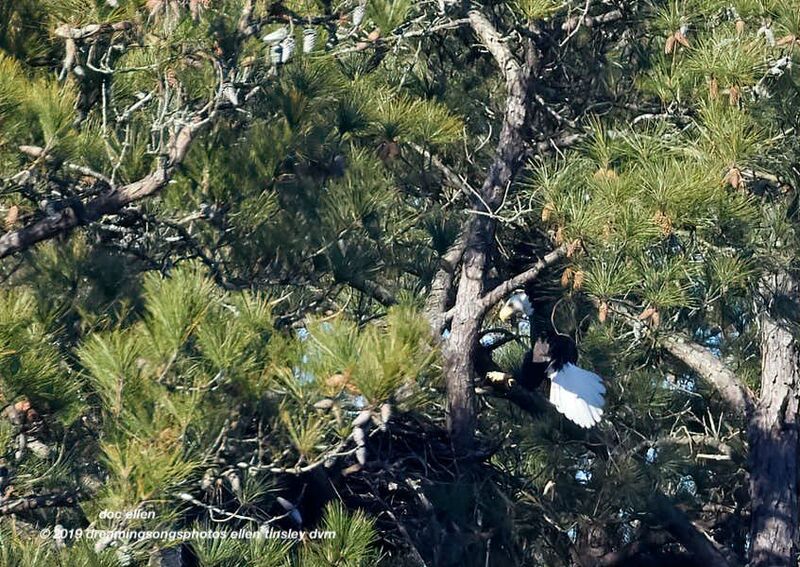 Petruchio lifted the branch all the way into the nest – more than 90 feet above the ground. The nest is unseen to his left. 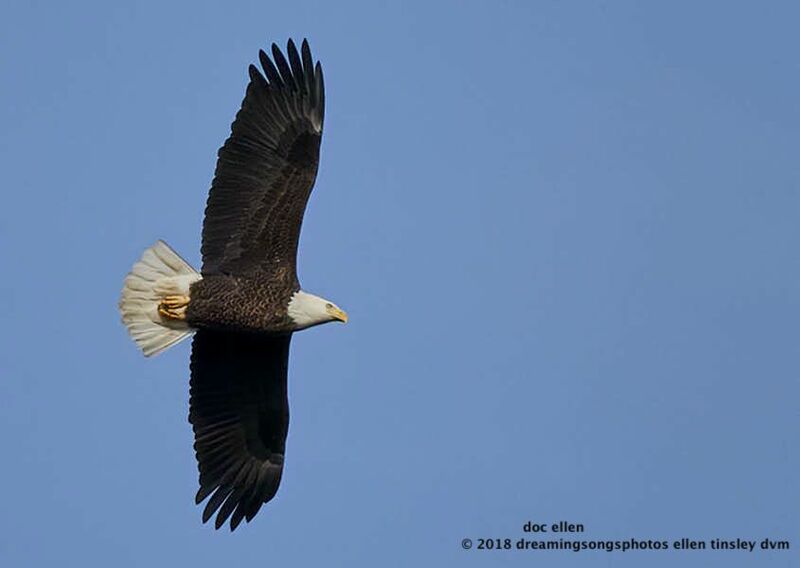 Yesterday, I was standing on top of the dam when a bald eagle appeared, flying up from the south end of the lake. 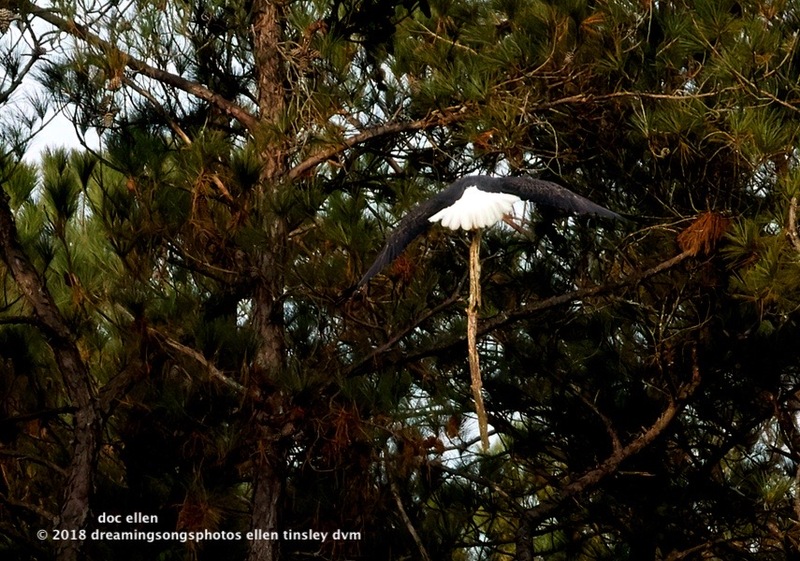 I got my lens on the eagle, and suddenly realized I knew her. 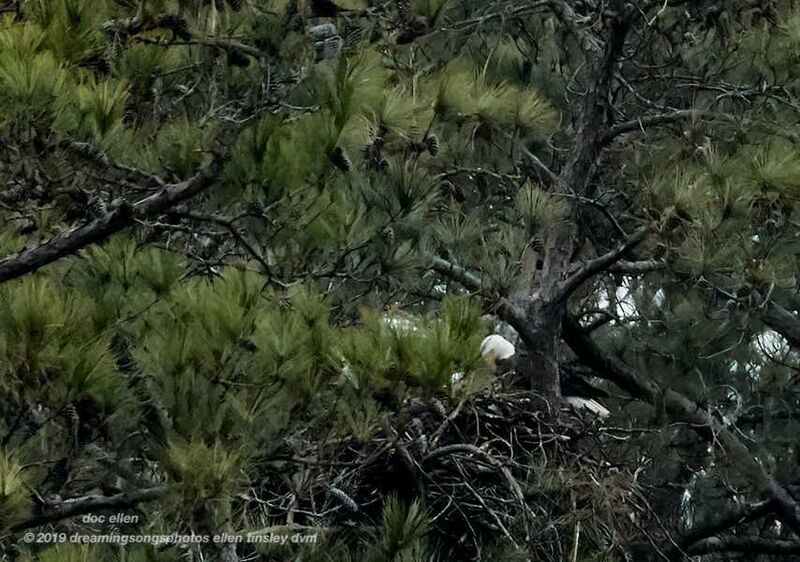 Kate is the mother eagle at First Nest. Kate turned her head and looked at me, changed her direction, made a single loop over me and headed back up lake. I haven’t seen her in about 5 months. This morning, I went by the First Nest cove. 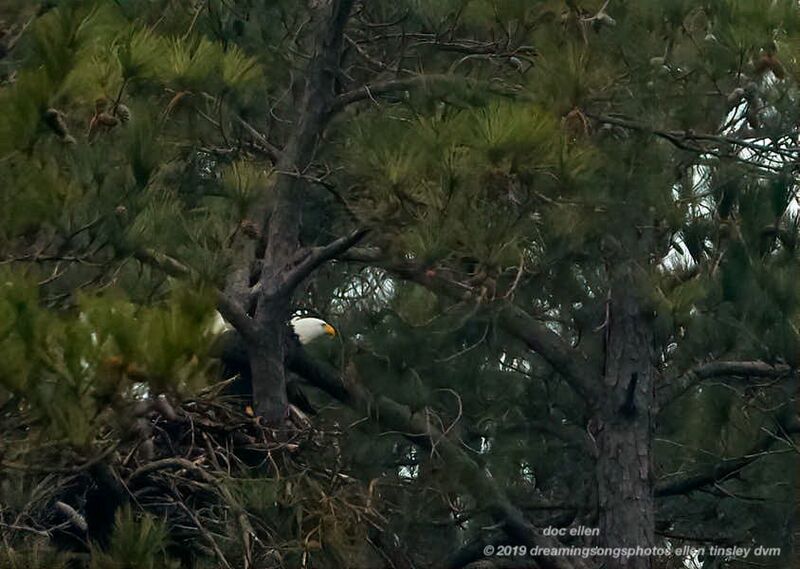 The nest looked okay and I could hear an eagle calling. 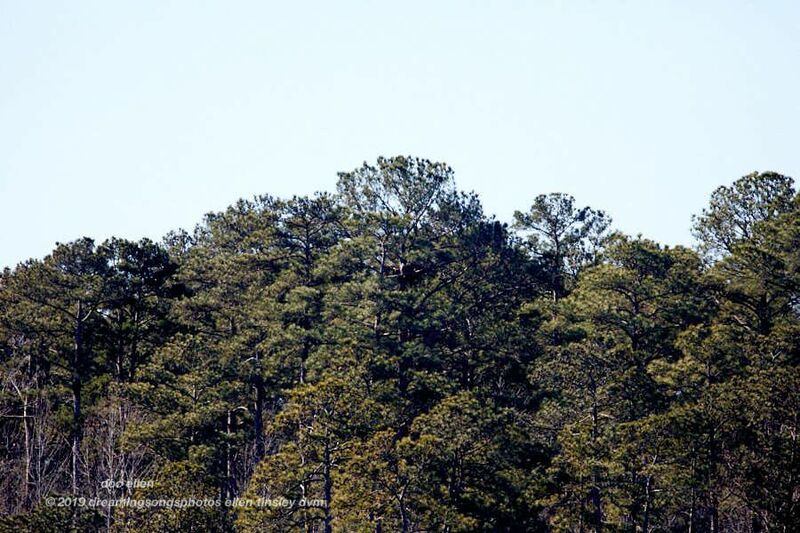 I finally found Petruchio, the father eagle of First Nest, sitting up high on a favored perch in a pine. While I was watching, he made a long swing down almost to lake level and I thought he was going fishing. Turns out he wanted to investigate what the crows were doing.